MCC Forensics team placed fifth in Team Sweepstakes at the recent Apel Quest Tournament at Moraine Valley Community College. Pictured are, from left, Nadia Merida of Harvard, Audre Knecht of McHenry, Caden Fosnaigh of Woodstock, Abigayle Ratcliffe of Huntley, and Elijah Abejide of Woodstock. 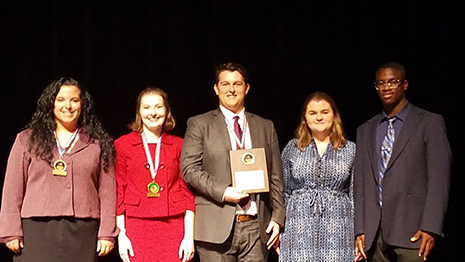 The MCC Forensics Team placed fifth in Team Sweepstakes at the recent Apel Quest Tournament at Moraine Valley Community College in Palos Hills. Competitors Nadia Merida of Harvard placed third in Prose Interpretation, Caden Fosnaigh of Woodstock placed third in Persuasive Speaking, and Audre Knecht of McHenry placed fifth in Dramatic Interpretation. Also competing was Elijah Abijade of Woodstock and observing was Abigayle Ratcliffe of Huntley. “I was thrilled that this brand new team was able to step up and win a team award at the first tournament of the season,” said Forensics coach Bonnie Gabel. The team is looking forward to their next competition at Highland Community College in Freeport, November 16-17.